Discussion in 'Weather & Natural Disasters' started by Harry Havens, Sep 5, 2018. Florence is puzzling everyone on the weatherboards, as it shouldn't be a Category 4, but is. No one has any confidence in where it is going, as the spaghetti models have been in every direction, although it seems to be tightening. Can it make it to the USA? We should sincerely hope not, as the warmer waters should intensify Florence's strength. But then Florence has managed to upset a lot of the modeling. Still a lot can happen, but we will know with certainty in about a week. Hurricane Center is now saying that it could definitely hit, outer bands perhaps, the Carolina coasts, which would impact northeastern Florida, where we are, but basically only along the beach areas. Then, it would turn back out to sea/Atlantic. It does show some indication of riding northward along the coast in about a week. What might need attention is the soon to be named Helene or invest 92L, which appears to be making a beeline towards the Greater Antilles in about 8 days and towards south Florida the following week. However, it should theoretically weaken prior to that. 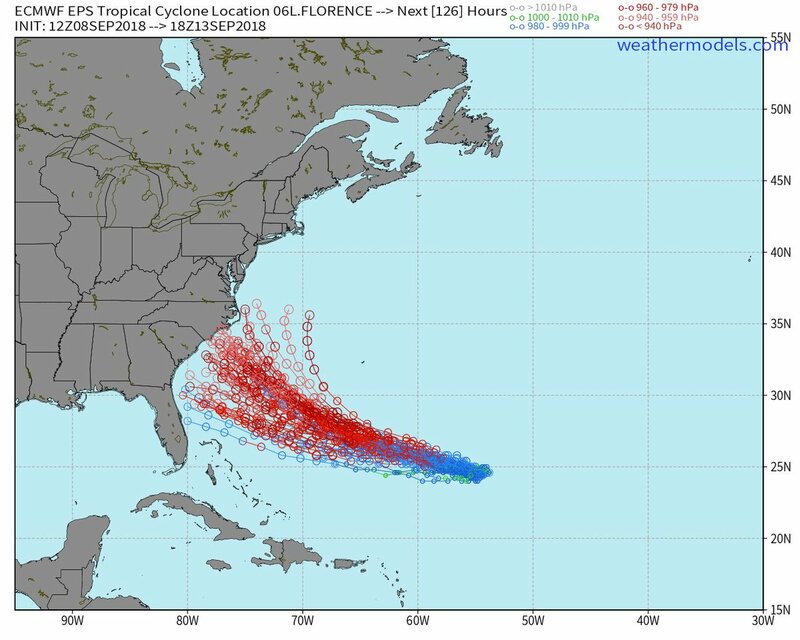 The path of Florence continues to narrow, with a potential near landfall somewhere between Miami and NYC... if at all. The border of N.C. and VA. being the most likely at this point, although a bit farther south remains a possibility. The "near landfall" being a possibility of the center of the eye staying just of the coastline and riding the coastline northward. Hurricane Olivia should drop to Tropical Storm status before striking Hawaii. Both Florence and Olivia could be near landfall around the same time... late next week. I threw in Olivia, as you may have not heard much about it and likely won't going forward. Well, with whatever happens out in that dang Atlantic, I really wish were weren't still living in Jacksonville or Florida...…..period! Bill Boggs and Harry Havens like this. My interest is not in predicting the weather, but rather predicting the news coverage. At this hour, the path has shifted south by one state... meaning S.C. and N.C come into play. It would appear it will be an upper Category 3, which means the coverage will reflect just that. It might share coverage with by then T.S. Olivia in Hawaii. If it migrates northward, as is possible, the reportage will start to intensify... even if the storm were to weaken. If it were to approach NYC, it will likely be reported as armageddon and you will hear nothing about Olivia. I think everyone outside the Beltway to New England corridor understands this phenomena. It is a Tropical Storm Florence for now, but is widely expected to be a hurricane again, sometime on Sunday. Confidence seems to be rather high that it will reach Major Hurricane Status later in the week. While it is still possible for it to turn north and miss the U.S., that possibility is weakening. The possibility of it moving up though the coastal states into N.E. is increasing. The path continues to narrow, however there are worries about steering currents. The Hurricane may begin to slow its forward progress and might even stall. That might sound good, but think Harvey. Lots and lots of rain. As for winds, Florence might be in the 140 mph range near landfall, which is still in question as to where, with the likelihood of no landfall getting less and less. As always a reminder about mph vs. force. An 140 mph wind is not twice as powerful as a 70 mph wind. 140 mph winds have roughly 4 times the force of 70 mph winds. Olivia should likely pass through the Hawaiian Islands next Wednesday with lots of rain and as a tropical storm. Helene is not likely an issue after passing by the Cabo Verde islands. Isaac will likely be a hurricane as it moves on the Lesser Antilles around mid week. Boy, @Harry Havens, economics AND meteorology! Cool!!! I have an enormous amount of links to various websites. I'm barely able to keep them sorted out. I have over 300 in the economics category with about 15 sub categories, which does not include the system D category. I need to spend about 2 weeks cleaning up all of my links, as some are dead links, others in wrong categories, etc. Over 80 in weather. About 30 categories altogether. Bill Boggs, Don Alaska and Harry Havens like this. Speaking of which... those models seem to be stiffening up, just like watching a video in reverse of spaghetti in boiling water. At this point, it looks like North Carolina is likely to get spaghetti in the face. All jokes aside, it not only appears landfall is likely in North Carolina, but significant rainfall will inundate not only N.C. but VA into PA, MD, DE, etc. Whether it is a really big hurricane will be talked about, but it is likely to be a really big mess. People here aren't concerned at all about any of it. Unless a tropical storm or hurricane is headed right for any part of Florida, most people here really don't care about the hurricane season. They say they will take a tropical storm or hurricane over any kind of snowfall anytime. We are just the opposite. Nancy Hart and Yvonne Smith like this. Florence is now Category 4, with really nothing in its way to decrease intensity. Not much sheer potential, nearly no dry air mass nearby, now entering much warmer waters. Incidentally, the previous map with rainfall amounts can now be likely considered as very optimistic. Some of the latest projections double and triple those amounts. There is still a slight chance of it still not making landfall, but it is very slight. Extensive flooding and widespread power outages are anticipated. Utility companies with reciprocal agreements have been preparing manpower and equipment, likely to begin moving towards staging areas as likely impact areas are established. The media is starting to ramp-up coverage, so off to the weather channel I go. Bill Boggs and Yvonne Smith like this.